“When you are a supplier to the global aerospace market, you get it right the first time—and every time after. This isn’t just a clever tag line we promote, but a commitment we make to each and every customer,” said Ben Voegeli, Exacta Aerospace’s general manager. Exacta Aerospace, Inc. of Wichita, Kan., is a family-run business that was founded in 1978 by current President Randy Voegeli with the assistance of his wife and company CEO, Bonnie Voegeli. Since its inception, the company has grown to become a leader in the manufacture of part components, sheet-metal details, kits and assemblies for the world’s largest aviation manufacturers. The operations of Exacta are shared with Randy and Bonnie’s two sons, Ben and Casey. According to Ben, the company’s current capabilities far exceed those of just under a decade ago. What once was a shop floor full of 3-axis vertical machining centers is now filled with automated cells of 4- and 5-axis machining centers. He attributes this dynamic change to the company’s 2003 investment with a Makino a51 horizontal machining center—its first high-speed horizontal purchase. Exacta’s investment decisions have been part of a larger strategic plan, Ben explained, which includes building its capacity to produce large, complex assemblies efficiently and maximize the company’s profitability. “Acquiring machines appropriate for all part sizes and geometries is a key factor when working with aerospace assemblies,” he said. With a large majority of the company’s work composed of aluminum, Exacta has focused much of its investments on automated aluminum machining capabilities. Following the success of the initial a51, the company acquired two additional a51s, along with an A77E horizontal machining center. The A77E offered similar capabilities as its a51s, but with a larger work envelope for applications such as hinges and truss ribs. In 2007, Exacta discovered new business opportunities for aluminum part sizes larger than those of the a71 and A77E, such as bulkheads, floor panels and large truss ribs. Again, Exacta went back out onto the market to find a suitable solution. 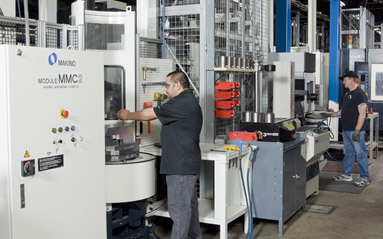 Exacta’s final decision was a MAG3EX 5-axis horizontal machining center. While it currently remains stand-alone, the company is also making preparations to integrate the machine into a cell with two additional MAG3EX’s in the near future. According to Ben, the MAG3EX clearly demonstrates Makino’s understanding of the aerospace market, due to its rigid design, 33,000-rpm spindle and cutting feedrates of 1,000 inches per minute. The MAG3EX clearly demonstrates Makino’s understanding of the aerospace market, due to its rigid design, 33,000-rpm spindle and cutting feedrates of 1,000 inches per minute. In late 2010, Exacta continued its expansion strategy into the rapidly growing market of titanium machining. Makino’s M-package machines are built specifically for hardened materials, such as titanium alloys. Their integral drive spindles offer significantly higher torque (1,009 Nm) at lower rpms than most standard horizontal machining centers. To match that torque, the spindle employs 50 hp from 2,000 to 5,000 rpm. 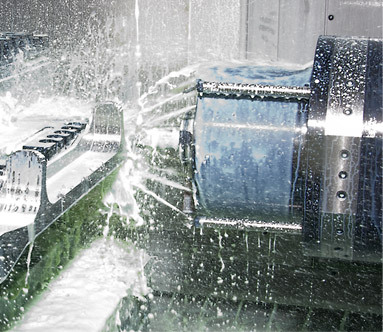 This duty rating and continuous output of the Makino spindle lends itself well to difficult cutting operations. According to Ben, 98 percent of the work performed on the a81M and the a82M is titanium alloy or hardened steel. 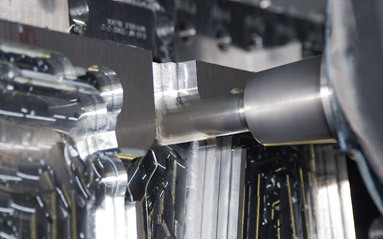 Integrated in an MMC2 [Makino Machining Complex] and equipped with tool life and tool length measurement systems, these machines provide Exacta with worry-free, unattended machining capabilities similar to those of its previous investments. “At this point, we can comfortably say that Exacta is a highly compe-titive company when it comes to machining titanium and other hardened materials,” Ben said. According to Eilerts, the a51 cell is currently the most productive piece of equipment on the shop floor, producing thousands of parts per year. In a typical week, the cell can be loaded with more than 20 jobs and have them machined complete and ready for on-time delivery. Because Exacta works with high volumes of parts and more than 1,500 different part varieties, Eilerts emphasizes the importance of accurate inventory tracking and efficient part distribution. The T4 5-axis horizontal machining center, Makino’s flagship product for ADVANTiGE, is designed specifically for the machining of large titanium aerospace structural parts. Exacta attributes much of its success to Makino’s support and its willingness to change processes and adapt to more efficient machining standards. Business partners like Makino enable Exacta to focus more on the future, explains Casey. Instead of dealing with day-to-day worries of inconsistent performance and costly downtimes, the company can work toward optimizing its processes and further expanding upon capacity and capabilities.